The sentinel lymph node (SLN) is the first lymph node to drain a metastatic tumor cell that drains via the lymphatic route. The concept of the SLN is based on the orderly progression of tumor cells within the lymphatic system. Mapping of the lymph flow from the tumor site to the regional lymphatic drainage area can be used to identify the primary draining lymph node (ie, SLN). If the SLN can be identified and examined for the presence of tumor metastases, an elective lymph node dissection for staging may not need to be performed. Approximately 3.3 million patients are diagnosed with 5.4 million cases of keratinocyte skin cancer (cSCC or basal cell carcinoma) in the United States each year. Approximately 80% of ultraviolet light–induced SCCs develop on the arms, head, or neck. The frequency of cSCC, as with all nonmelanoma skin cancers, is increasing. Recent projections suggest 300,000-400,000 new cases of cSCC per year. By 2017 estimates (American Cancer Society Facts and Figures),  approximately 70,000 cases of HNSCC are diagnosed in the United States each year. SCC can occur in any mucosal area of the head and neck, including the nasal cavity and sinuses, nasopharynx, oral cavity (including lower lip), oropharynx, larynx, and hypopharynx. Smoking and alcohol use are historically the primary risk factors for HNSCC, but the incidence of human papillomavirus (HPV)–related cancers of the oropharynx is rising rapidly. The latter rarely present without nodal disease, so SLNB is unlikely to have a role in the management of HPV-related tumors of the oropharynx. SLNB has primarily been investigated in lesions of the oral cavity, given the historically high rates of nodal metastasis noted above and the accessibility of these tumors for radiotracer injection. It can have a significant impact on the need for lymph node dissection. Positron-emission tomography (PET-CT), contrasted CT, and MRI are commonly used to classify tumors and nodal or distant metastases of SCC. Definitive staging of lymph node disease can only be achieved by performing a staging lymph node dissection. For mucosal disease in its early stages (T1-T3, N0), clinicians have to balance the benefit of performing an elective (prophylactic) lymph node dissection against the associated morbidity. For cSCC, elective neck dissection is uncommon. For more information, see Head and Neck Cancer and Head and Neck Squamous Cell Carcinoma. In addition, immunocompromised patients have a much higher risk of developing SCC. Two genes, PATCHED and TP53, have been identified that usually prevent cancers but are inactivated in patients with SCC; TP53 is mutated in more than 90% of patients with SCC. cSCCs typically manifest on the head, neck, or arms. They usually have elevated and rolled edges with central ulceration. Well-differentiated SCCs are likely to manifest as firm erythematous nodules of varying sizes, sometimes with an area of central hyperkeratosis. The tumor is usually firm, although tumors in more advanced cases can be soft and friable. Erosion and ulceration are more common with SCCs. Poorly differentiated SCCs are more apt to manifest as faintly erythematous nodules or plaques that are not well defined; ulceration is also common. 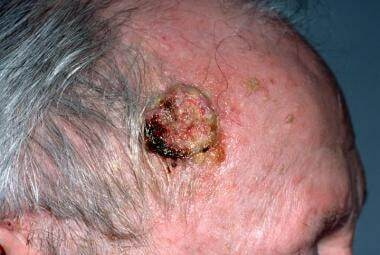 Large, sun-induced squamous cell carcinoma (SCC) on the forehead/temple. Image courtesy of Glenn Goldman, MD. HNSCC typically manifests as an irregular, at times ulcerated, friable mass of the oral, oropharyngeal, laryngeal, hypopharyngeal, nasopharyngeal, or sinonasal mucosa. Lesions appearing in the oral cavity are subclassified according to anatomic location; the lower lip can exhibit HNSCC on the mucosal surface or cSCC on the skin surface. Oral cavity HNSCC is most amenable to SLNB because of the generally easy accessibility of the primary lesions. Defining a successful SLNB accurately is critical. Although some studies have examined the impact of an individual surgeon's experience on the SLN identification rate, SLN identification is clearly not an appropriate endpoint; many studies have documented excellent SLN identification rates with unacceptably high false-negative rates, typically defined as a negative SLNB when there is either a metastatic lymph node at the time of surgery or recurrence in the nodal basin where the SLN was identified. The more important issue is the experience required to achieve an acceptably low false-negative rate. Such rates are typically identified through prospective studies in which the neck is dissected after an SLNB to provide a point of comparison. In cases in which the pathology results from the scintigram are unclear or are negative, a formal elective neck dissection should be considered for staging purposes. This procedure is multidisciplinary. As such, surgeons must ensure that experienced nuclear medicine specialists, radiologists, and pathologists are involved. The learning curve for individual surgeons is undoubtedly associated with the experience levels of specialists within the multidisciplinary team. The implications of the SLN procedure must be effectively communicated to radiation oncologists and medical oncologists. The coordination of effort among the various specialists in each discipline is an essential component of the learning process. For patient education information, see the Cancer and Tumors Center, as well as Skin Cancer, Skin Biopsy, and Cancer of the Mouth and Throat. SLNB has been used in larger cutaneous tumors (at least T2) with clinically negative lymph node evaluation. Data from a systematic review show a positive SLN rate of 13.5% in patients carefully selected for the procedure. Given that elective nodal basin dissection is rarely performed in cSCC, SLNB can be used to determine the need for therapeutic nodal dissection. While the survival benefit of such an approach has not yet been fully elucidated, it stands to reason that diagnosing subclinical nodal metastasis and providing complete treatment of locoregional disease is likely to improve both disease-specific and overall survival. As in melanoma, the challenge of performing SLNB in cSCC of the head and neck is that the predictability of SLN location is lower and the likelihood of multiple SLNs is higher than in other body locations. [9, 13] Identification of multiple SLNs can result in the need for multiple operations to evaluate disease status. SLNB has been studied primarily in HNSCC of the oral cavity. The primary role is in cases in which an elective neck dissection is considered, which often occurs when the primary tumor is staged as T1 or T2. In a large multicenter European trial, a negative SLNB in T1-2N0 oral cavity SCC was sufficient to rule out nodal metastasis in 86% of cases, producing a negative predictive value of 95%. This approximates the negative predictive value of SLNB in melanoma. While historically floor-of-mouth tumors were believed to be inappropriate for SLNB because of “shine-through” (misleading detection of signal from the primary injection site), this association was not observed in the study. A prospective Japanese trial that included T2 and T3 tumors found benefit for directing neck dissection with SLNB. Further trials are needed to verify that SLNB alone is sufficient to provide sufficient staging, and thus prognostic, information. Important to note, a 2015 multicenter trial in the United States demonstrated efficacy of SLNB in appropriately selected oral cavity cancers when using technetium Tc 99m tilmanocept. Data from experienced centers continue to support further investigation and careful implementation of these techniques. Contraindications to SLN biopsy are clinical lymphadenopathy (based on physical examination or imaging), disruption of lymphatic drainage, prior extensive surgery (eg, dissection of the neck), previous radiation to the head and the neck, and adverse reaction to radiotracer compound. SLNB can be a valuable staging technique for patients with cSCC or HNSCC whose lymphatic drainage has not been altered by previous surgery or radiotherapy. It provides reliable detection of micrometastasis, indicating the need for directing therapy (lymphadenectomy or radiotherapy) to the draining nodal basin. This technique also allows the surgeon to accurately plan a dissection of the neck, taking into consideration the pattern of lymphatic drainage of each patient, for example, understanding if the lymphatic drainage is unilateral or bilateral, or if multiple distinct nodal basins are involved. For example, a midface cSCC could drain to the parotid nodes, facial nodes, upper cervical nodes, or more than one of these sites. In the setting of elective surgical nodal treatment, all of these would need to be addressed, which would present substantial and often unnecessary morbidity to the patient. Sentinel lymph node mapping clarifies the drainage pathway(s) in this setting. In this way, unnecessary dissection and associated morphofunctional sequelae can be avoided in numerous patients. Multiple studies have reviewed the outcome of patients undergoing sentinel lymph node biopsy of the head and neck. It has been shown that positive SLNB correlates with poorer disease-specific survival and overall survival in HNSCC, while not definitely affecting survival in cSCC. [1, 7, 14] Two major studies showed evidence of benefit from mapping of aberrant drainage pathways that directed dissection to levels not always included in an elective neck dissection (IIB, IV). [1, 14] At a minimum, data show that SLNB does not appear to adversely affect outcome. No studies exist that have directly compared morbidity associated with SLNB to that of elective nodal dissection, but it appears overall that SLNB provides a promising way to decrease morbidity while achieving the same or improved disease control for HNSCC and cSCC. Allergic reactions to radiotracer, nerve injury, lymphedema, neuropathy, fat necrosis, seroma, and hematoma can result following SLNB. Miura K, Hirakawa H, Uemura H, Yoshimoto S, Shiotani A, Sugasawa M, et al. Sentinel node biopsy for oral cancer: A prospective multicenter Phase II trial. Auris Nasus Larynx. 2017 Jun. 44 (3):319-326. [Medline]. Durham AB, Lowe L, Malloy KM, McHugh JB, Bradford CR, Chubb H, et al. Sentinel Lymph Node Biopsy for Cutaneous Squamous Cell Carcinoma on the Head and Neck. JAMA Otolaryngol Head Neck Surg. 2016 Jul 20. [Medline]. Green B, Blythe J, Brennan PA. Sentinel lymph node biopsy for head and neck mucosal cancers - an update on the current evidence. Oral Dis. 2016 Sep. 22 (6):498-502. [Medline]. Alex JC, Weaver DL, Fairbank JT, Rankin BS, Krag DN. Gamma-probe-guided lymph node localization in malignant melanoma. Surg Oncol. 1993 Oct. 2(5):303-8. [Medline]. Alex JC, Krag DN. The gamma-probe-guided resection of radiolabeled primary lymph nodes. Surg Oncol Clin N Am. 1996 Jan. 5(1):33-41. [Medline]. Karia PS, Han J, Schmults CD. Cutaneous squamous cell carcinoma: estimated incidence of disease, nodal metastasis, and deaths from disease in the United States, 2012. J Am Acad Dermatol. 2013 Jun. 68 (6):957-66. [Medline]. Ahmed MM, Moore BA, Schmalbach CE. Utility of head and neck cutaneous squamous cell carcinoma sentinel node biopsy: a systematic review. Otolaryngol Head Neck Surg. 2014 Feb. 150 (2):180-7. [Medline]. American Cancer Society. American Cancer Society Facts & Figures 2017. Available at https://www.cancer.org/content/dam/cancer-org/research/cancer-facts-and-statistics/annual-cancer-facts-and-figures/2017/cancer-facts-and-figures-2017.pdf. 2017; Accessed: December 5, 2017. Morton DL, Cochran AJ, Thompson JF, Elashoff R, Essner R, Glass EC, et al. Sentinel node biopsy for early-stage melanoma: accuracy and morbidity in MSLT-I, an international multicenter trial. Ann Surg. 2005 Sep. 242 (3):302-11; discussion 311-3. [Medline]. Dequanter D, Shahla M, Paulus P, Lothaire P. Long term results of sentinel lymph node biopsy in early oral squamous cell carcinoma. Onco Targets Ther. 2013. 6:799-802. [Medline]. Yoshida Y, Shiomi T, Tahira M, Yamamoto O. Metastatic basosquamous carcinoma detected by sentinel lymph node biopsy. J Dermatol. 2013 Jun 3. [Medline]. Govers TM, Hannink G, Merkx MA, Takes RP, Rovers MM. Sentinel node biopsy for squamous cell carcinoma of the oral cavity and oropharynx: A diagnostic meta-analysis. Oral Oncol. 2013 May 13. [Medline]. O'Brien CJ, Uren RF, Thompson JF, Howman-Giles RB, Petersen-Schaefer K, Shaw HM, et al. Prediction of potential metastatic sites in cutaneous head and neck melanoma using lymphoscintigraphy. Am J Surg. 1995 Nov. 170 (5):461-6. [Medline]. Schilling C, Stoeckli SJ, Haerle SK, et al. Sentinel European Node Trial (SENT): 3-year results of sentinel node biopsy in oral cancer. Eur J Cancer. 2015 Dec. 51 (18):2777-84. [Medline]. Agrawal A, Civantos FJ, Brumund KT, Chepeha DB, Hall NC, Carroll WR, et al. [(99m)Tc]Tilmanocept Accurately Detects Sentinel Lymph Nodes and Predicts Node Pathology Status in Patients with Oral Squamous Cell Carcinoma of the Head and Neck: Results of a Phase III Multi-institutional Trial. Ann Surg Oncol. 2015 Oct. 22 (11):3708-15. [Medline]. Garrel R, Poissonnet G, Temam S, Dolivet G, Fakhry N, de Raucourt D. Review of sentinel node procedure in cN0 head and neck squamous cell carcinomas. Guidelines from the French evaluation cooperative subgroup of GETTEC. Eur Ann Otorhinolaryngol Head Neck Dis. 2017 Apr. 134 (2):89-93. [Medline]. Tends to arise from pre-malignant lesions, actinic keratoses; surface is usually scaley and often ulcerates (as shown here). Image courtesy of National Cancer Institue. Sentinel lymph node biopsy of the skin. Three-panel illustration showing a radioactive substance and/or blue dye is injected near the tumor (first panel), the injected material is detected visually and/or with a probe (middle panel), and the sentinel nodes (the first lymph nodes to take up the material) are removed and checked for cancer cells (last panel). Image courtesy of National Cancer Institue.